Thanks to this fellowship I could dedicate half of my weekly time to convert my bionic leaves to work at a smaller scale, a scale that can be appreciated directly and daily by all people and designed around people. This conversion involved both technical development and aesthetical research. The light emitted by the “living chandelier” not only illuminates the space but also stimulates the BioSolar Leaf photosynthetic ability to enable an automatic indoor air purification. Chandeliers have always been a strong symbol of social trends, craft techniques and luxurious aesthetics of a precise historic period; I believe my new work embraces the essence of our generation thanks to the novel technologies, shapes and techniques I used and the benefits it gives. The world’s first “living chandelier”. It was also very good to explore people’s reaction to the multiple level of symbiosis that this “living material” establishes with the object and the people. The light of the chandelier stimulates the BioSolar Leaf to photosynthesise and the CO2 produced by the people in the room feeds the living chandelier that in turn converts it into oxygen that is breathed back by the same people establishing a new level of symbiosis between an object (or “living object”) and its user. Your fellowship gave me the invaluable chance to develop further my material for this specific application and gave me the time to craft the final chandelier aiming to ultimately bring this novel living material to every home. Further information on the world’s first living Bionic Chandelier which purifies the air indoor. This piece explores how advances in biotechnology and engineering can be applied to everyday objects and architecture to increase the quality of our lives. The chandelier purifies the air indoors through photosynthesis performed by living microalgae enclosed into leaf modules. This is also the first living object which continuously grows while performing biologically-driven depurative functions. The light of the chandelier illuminate the space but also stimulates photosynthesis performed by tiny microalgae, this living microorganisms feed on carbon dioxide while releasing breathable oxygen into the room. This biological process performed by the chandelier establishes and explores a new symbiotic relationship between object and people where life-giving resources are constantly exchanged, and where each other waste enables respective metabolic processes. This exchange recalls how biospheric systems work, where waste ultimately doesn’t exist but is a valuable resource for other elements in that system. Exhale is now part of the prestigious V&A permanent collection. The design follows Julian’s biomimicry approach of “forming through function” while taking inspiration from nature and the V&A’s Art-Nouveau and Islamic Art collections. The metal structure is entirely hand-made and burned-colored. Each structure holds a single leaf module of 3 different sizes that repeats it-self 70 times on a radial array; similar to how nature shapes plants and shells. 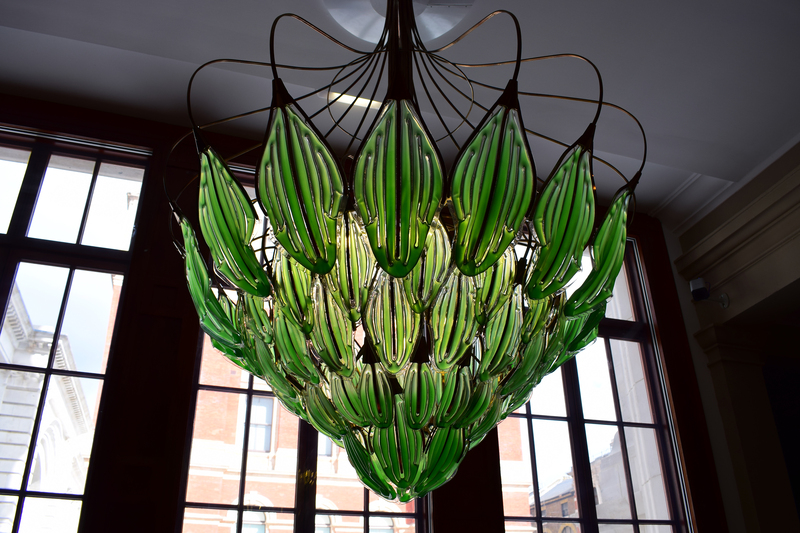 The Bionic Chandelier is connected to a life-support-unit device, developed by Arborea’s engineers, which nourish and maintains the microorganisms culture alive.